I started my Postcard Project to cure “traveler’s amnesia.” This is a term I use to describe the phenomena in which you spend all day soaking in the sights; seeing and experiencing everything you can, and by the time you get back to your room you can’t remember the proper name of any of those incredible places you just visited! I know it doesn’t happen to everyone. Some people astound me with the detail they can recall, but I am never going to impress anyone with this talent. Solution: Postcards! These little babies are the perfect mini journal for all of the list-makers out there. Here’s how it works: I try to buy a post card as soon as I land in a city. (Luckily airports and train stations are about as big as it gets for cheap, tourist-attracting souvenirs, so it’s never hard to locate a post card stand.) **Note: it is becoming increasingly difficult to find 3 1/2 x 5” postcards, so if you are just starting out, buy an album that will hold 4.25 x 6” postcards. 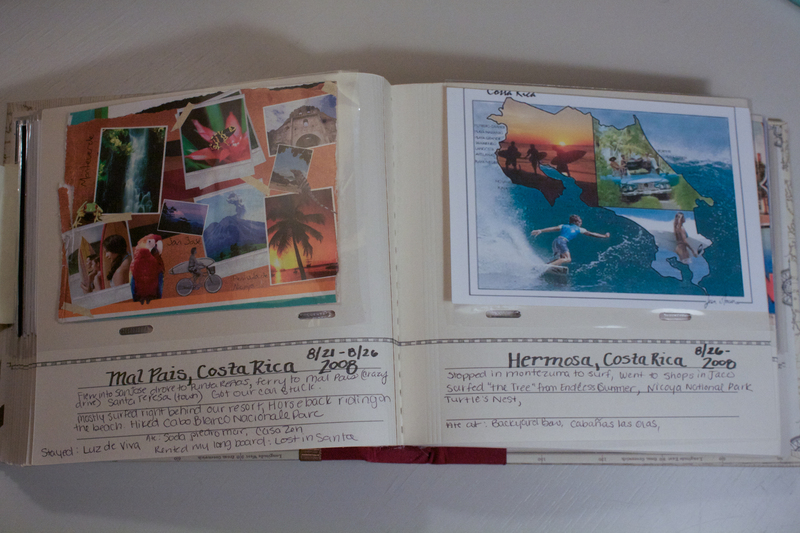 ** I have to cut mine down now to fit into the album I started with. I keep the postcard tucked into a guide book, purse or camera bag- something that I know I will have with me all the time- and then I just keep a list on the back of the card of the highlights from each day. Usually it serves as an itinerary recap, but I also add names and contact information for people I meet along the way and all of the best restaurants and shops I discover. Keeping a postcard list is especially helpful when you are breezing through several cities in a few days because it keeps things from blurring together. It’s also a great way for me to make sure that I get the spelling of certain sites (especially in non-English speaking countries) right. I try to copy the name of the site directly from a sign or map, because even as a former spelling bee runner-up, I’m not so great at sounding things out in foreign languages. My obsessive postcard list came in especially useful on our trip to Vegas last month, when my mom and I spent an entire afternoon wandering the strip checking out dozens of hotels and restaurants. f I hadn’t been keeping a list I would never have remembered what restaurant went with which hotel. Some people can, but my mind just doesn’t work like that! My postcard project makes the whole process less daunting. 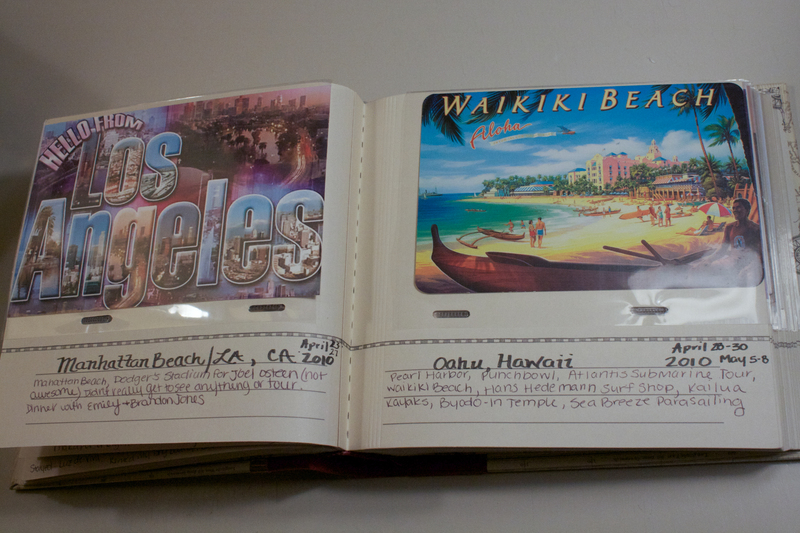 There are no stacks of picture albums and scrapbooks. Just one small album. It is kind of the concordance of my travels. 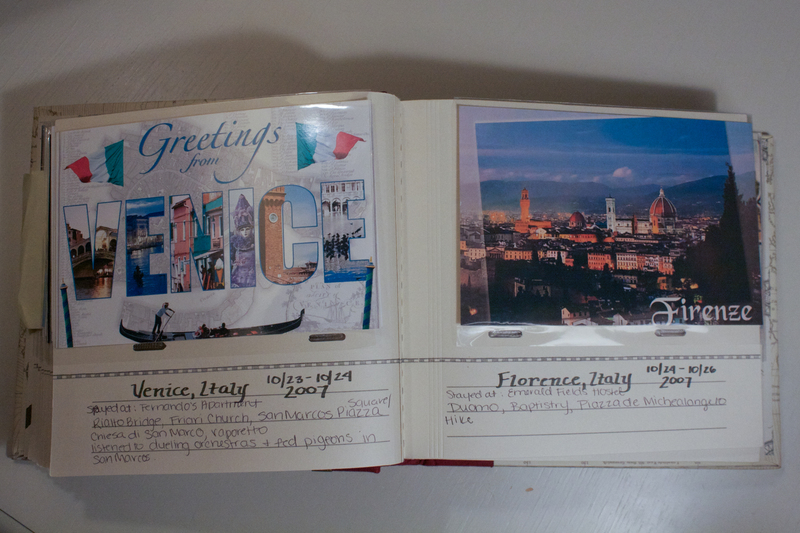 There is one page for each city I have visited: One picture (hopefully a great one- given that it is a postcard after all) and underneath, I list the dates I was there, where I stayed, and the highlights from the back of the card. A lot of the information back there isn’t anything I need to transcribe to the album, but it’s nice to know it’s still there if I take the postcard out. I’ve found this album to be the perfect way of jogging my memory at a glance. Originally I called it my postcard “project” because I was trying to track down postcards from all the trips I had taken before I developed this brilliant plan- and tracking them down was indeed a project! I found myself buying them on ebay and etsy before finally deciding to just print some of my own. I’m all caught up now, but I like the idea of it still being a project. Traveling always kind of is. I went retroactive a few years ago when I started and printed a bunch of them from the computer. I had looked to buy them online but it is impossible to just get cheap ones anywhere, so I either made my own or printed cute ones I had found. I love this idea! I will need to get going to catch up!